There has been an outflow of public sympathy for Papua New Guinea’s iconic flag designer, Susan Karike Huhume. Her body has lain in rest at Dove Funeral Homes for three months, after a promised state funeral never materialised. 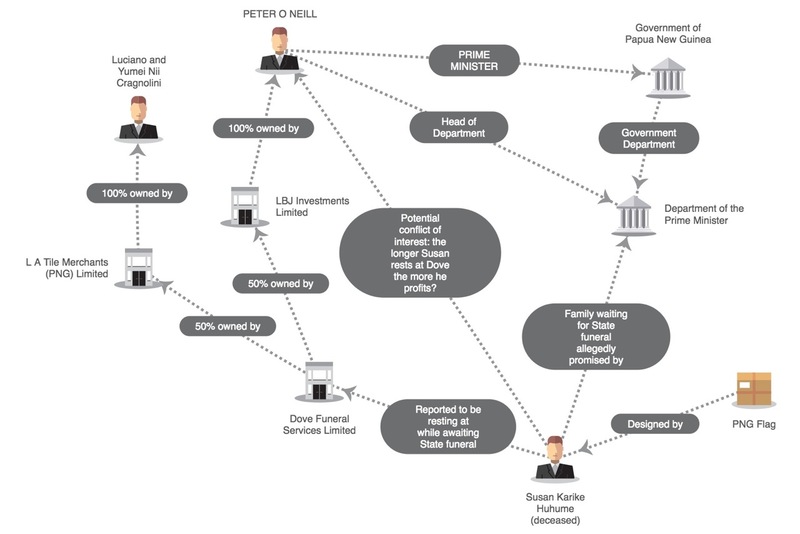 PNGi can reveal that Dove Funeral Homes is owned by three of the richest individuals in Papua New Guinea, Peter O’Neill, Sir Luciano Cragnolini and Lady Yumei Nii Cragnolini. The story of Susan’s death and treatment at the hands of the national government, is an allegory for the state of the nation. At the age of just 15, Susan’s now iconic and widely loved design for the national flag – humbly drawn on a page taken from her school exercise book – was selected as the winner in a national competition, overseen by the Constitutional Committee. Despite her talent, Susan spent her final years in poverty. She was not one of the mobocracy. Last year, the Post-Courier visited the late Susan’s family home, an improvised shack on the periphery of the Laloki Psychiatric Centre outside Port Moresby. Would she have been treated differently in another country? She looked embarrassed that there was no furniture for the visitors to sit; a white man, Dave Lornie was with us. She could not offer a cold drink in the hot July sun. The only thing of any value seemed to be a rather large specimen of her handiwork – the Red, Black and Gold. The bare soil was dusty and her grandchildren, unkempt as they were, quickly paraded around the flag of Papua New Guinea. Susan died on the 11th of April this year at Port Moresby General Hospital, aged 60. This, sadly, is the life expectancy for those who cannot visit Singapore or Cairns to receive world class medical treatment. Susan has not found peace yet. After her passing, Prime Minister Peter O’Neill paid tribute to Susan, sharing the nation’s condolences with her family. ‘The symbol of her creation will live centuries beyond her years, and be flown on our flag poles for generations to come in Papua New Guinea and around the world’, O’Neill remarked. Media reports claim three weeks after her passing Susan’s family was assured that the State had taken charge of Susan’s body and were handling the funeral arrangements. However, in news last week it was reported that Susan’s family have been abandoned by the National Government, who have failed to bury this iconic figure. The cost of having her body kept in wait at Dove Funeral Services, now threatens to bankrupt her family. ‘The family members [of Susan]are shattered and don’t really know what to do because in the time it has taken for the Government to come good with its undertaking, donations of cash received from sympathizers and people of goodwill had all been exhausted’. ‘I should think that it is quite a bit by now; three months is a long time’, she said. It appears the national government’s dithering over a state funeral, is going to rob the nation of a fitting tribute to Susan, while seemingly enriching the owners of Dove Funeral Homes. And here is the macabre twist. According to Investment Promotion Authority records, Dove Funeral Services Limited is jointly owned by the Prime Minister, Peter O’Neill, Sir Luciano Cragnolini and Lady Yumei Nii Cragnolini. These individuals are among the three richest businesspeople in the country, who have benefited directly from a wide range of government contracts. We are told by The National Sir Luciano Cragnolini was knighted in 2012 for his ‘service’ to the construction industry and his humanitarian contribution to Papua New Guinea – sadly, it appears, this humanitarian face does not extend to poor Susan Karike. How does a nation, who everyday suffers the effects of an appallingly underfunded and mismanaged health service, that sees their loved ones dying prematurely and often unnecessarily because of government neglect, feel about having a Prime Minister who owns a Funeral Home that stands ready to profit from some of those deaths? Surely, the Cragnolinis and Peter O’Neill, given their immense collective fortune, can spare some pocket change to relieve Susan’s family of the stress and anxiety they are now feeling, by burying this icon without charge, and give her a fitting tribute.